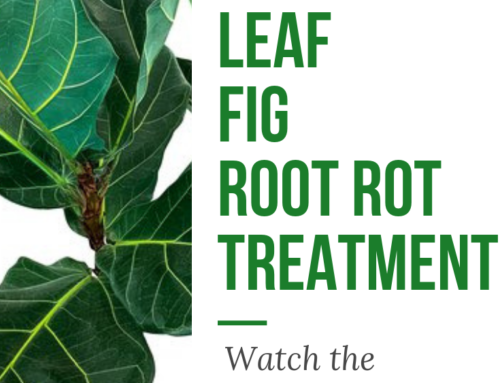 The fiddle leaf fig tree is known primarily for its big, beautiful leaves. So when those leaves are dull, dusty, or covered in chalky white residue, the plant really loses a lot of its personality. 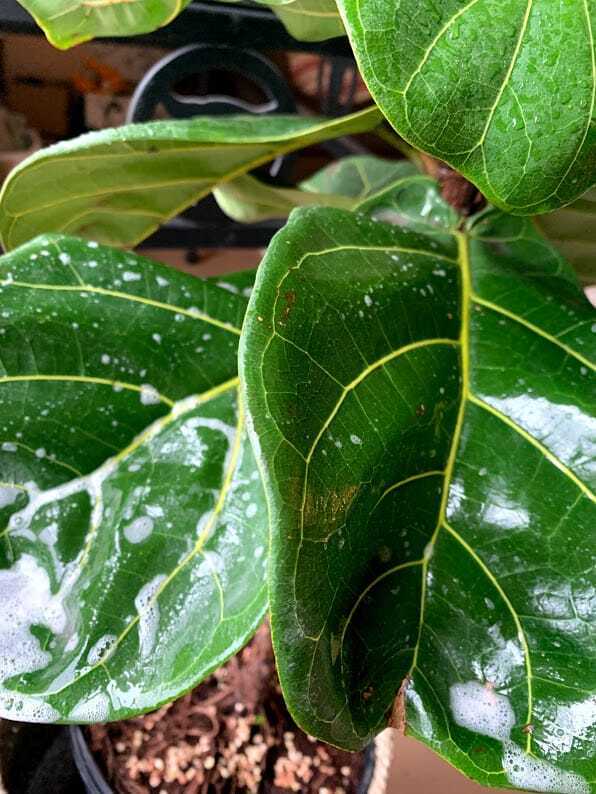 One of the most common reasons the ficus lyrata plants lose their shine is because of hard water spots. But you also know that you don’t want to traumatize those leaves by scrubbing them like you would limescale deposits on the bathroom faucet, for example. 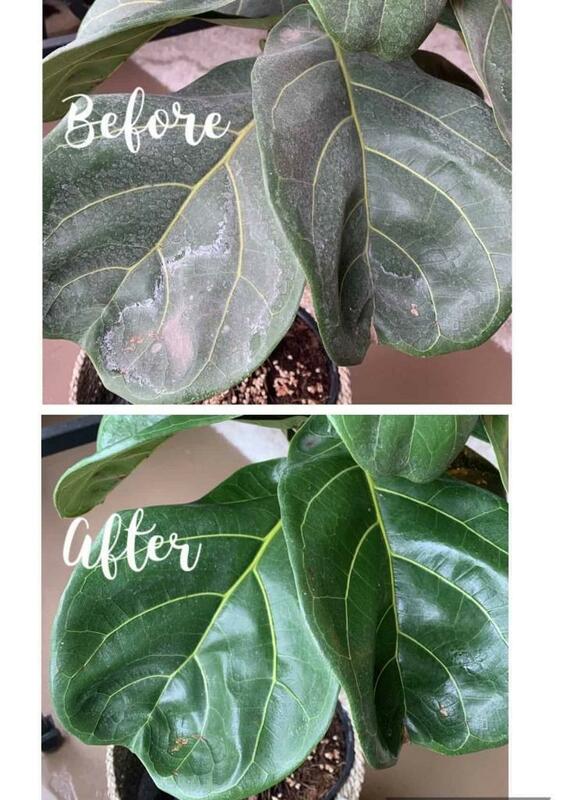 There is a way to remove the white residue that often comes home from the nursery or greenhouse (or accumulates over time in your own home) — all without hurting your plant’s foliage. 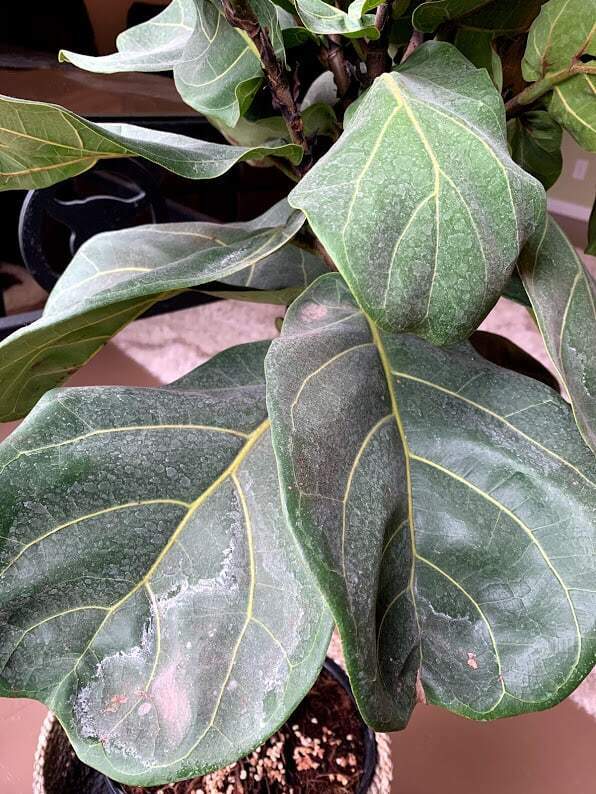 What Causes the White Residue on Leaves? 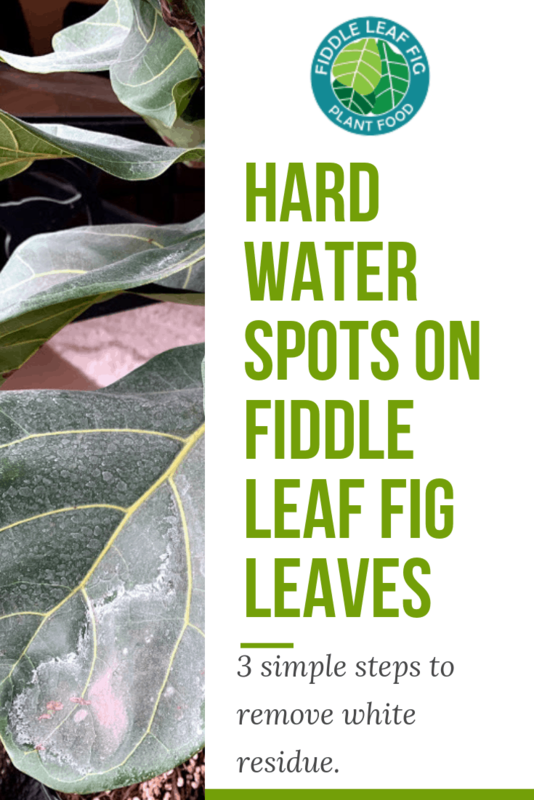 Before tackling the treatment of hard water spots on fiddle leaf fig trees, you should learn how they get there in the first place. When plants are sprayed or watered from above, much of the moisture evaporates, leaving behind lime, carbonate, iron, sodium, magnesium, calcium, and other natural minerals. Many garden centers also spray soluble fertilizers that leave behind salt deposits as well. 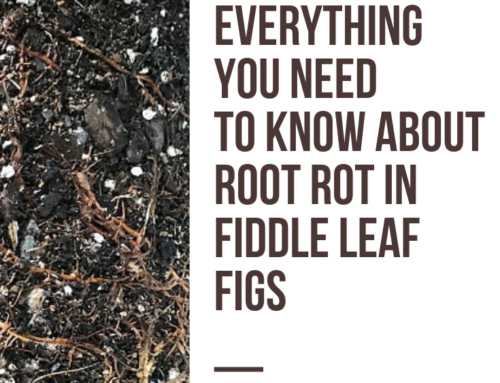 According to experts at the University of Maryland, both types of deposits can hurt your plant by inhibiting the plant intake of available moisture. Further, they can alter the pH of your substrate, blocking nutrients from absorption. One final source of powdery looking remnant is a spray often used to prevent desiccation, a very common winter foliar injury. The best step to take right away? Switch to softened, filtered water if you haven’t already. 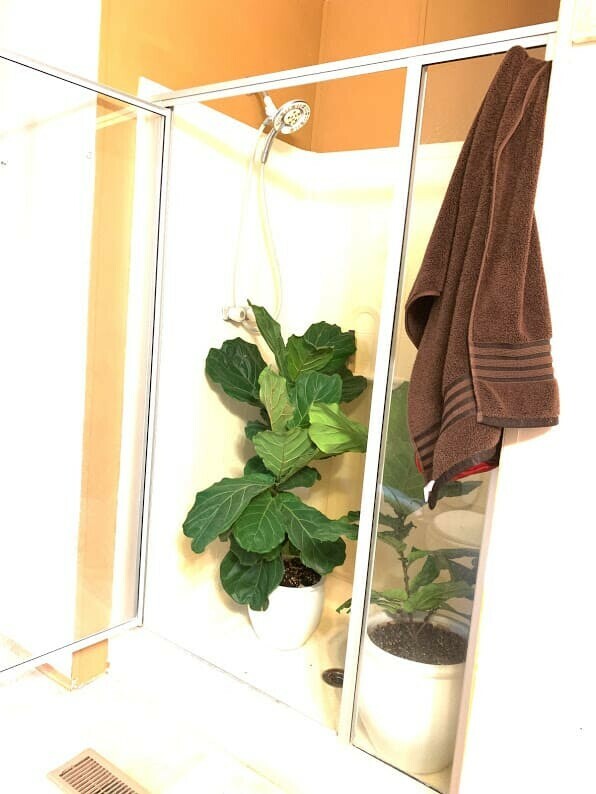 Your tree loves a good shower, so instead of nixing that from your routine, simply switch water sources. Also, ditch fertilizer sprays. 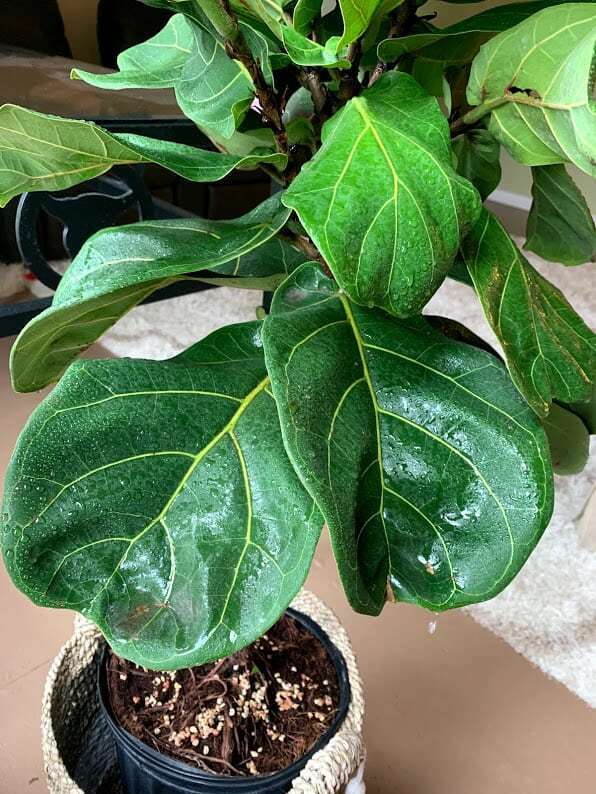 Go for a fertilizer formulated just for fiddle leaf figs — one that you can mix into your root-watering regimen instead. Now that you know how to prevent another buildup, let’s deal with the problem at hand: the dappled leftovers from hard water and fertilizer sprays. 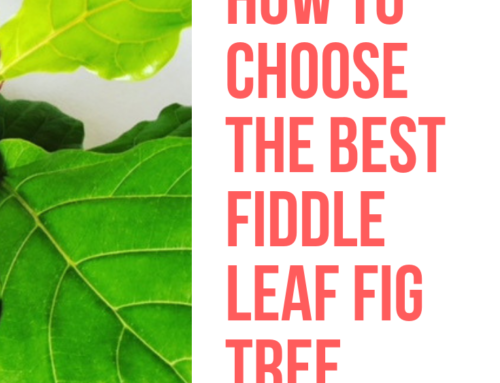 If you have a large fiddle, choose a day to do this when your plant is dry, so you can more easily move it around. 1 tsp. detergent-free soap (True soaps are historically made with natural ingredients like lye, ashes, animal or vegetable fats, and salts, while detergents include materials which have been synthesized into chemicals. For more information on the difference between detergents and soaps, check out the short, fascinating ebook from the American Cleaning Institute called The Science of Soap. One of the best detergent-free soap options is Dr. Bronner’s pure organic castile soap, which is what we’re using for this demonstration. Step one: Fill your spray bottle with clean water and spray to thoroughly wet your plant’s leaves. Let the water sit on the leaves surfaces for at least five minutes, but not so long that it begins to evaporate. This allows the water to start breaking down the minerals. Step two: Combine your soap and distilled water, mixing well. Use this mixture to soak your rag. Then, supporting each leaf from underneath with one hand, wipe the surface with the wet cloth. You want to be gentle, since trauma to the leaves never heals. If you take your time, you won’t hurt the plant. Step three: The third and final step is to wash the soap off each leaf. A good shower or outdoor rinse will do the job. 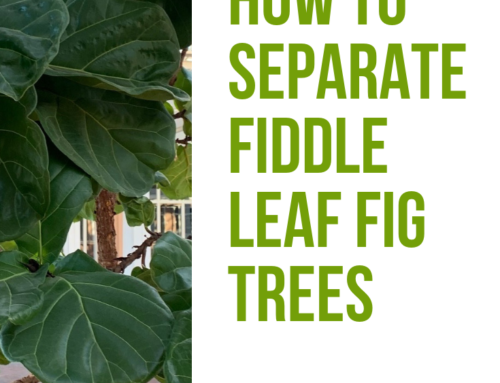 If you like, tilt your tree slightly so the soapy water runs off each leaf and onto the ground or down the drain, not into your soil. There you have it: A before-and-after of our cleaned and rinsed leaves, which are enjoying deep breaths for the first time in a long while. Again, the best, most effective way to clean these spots from your leaves involves all three steps. 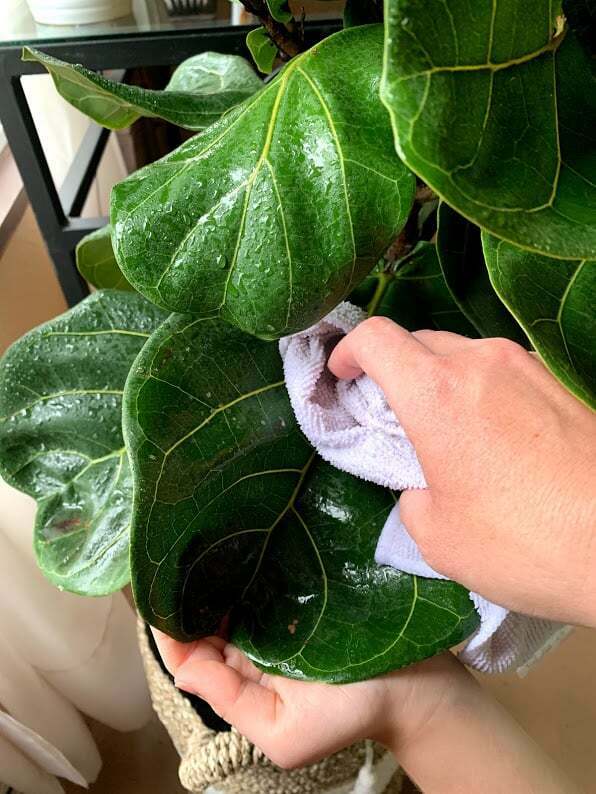 But good news: you can certainly get away with simply wiping each leaf with a damp cloth between more thorough cleanings. Don’t scrub or use abrasive pads, wire brushes, or scourers. Skip cleansers including “natural” alternatives like vinegar, lemons, baking soda, essential oils, and peroxide. Avoid the extra step of layering on coconut oil, mayonnaise, milk, and leaf shine products. 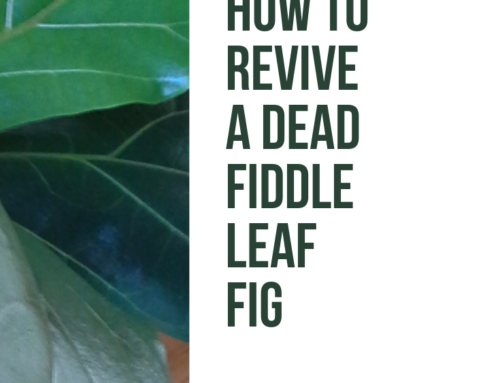 For more information on growing a healthy, happy, shiny ficus lyrata, pick up a copy of The Fiddle Leaf Fig Expert. And share your before-and-after photos with us, too!